Place Value, Place Value, Place Value! I suspect most first and second grade teachers will agree that place value is a significant concept in the development of number sense. I am more convinced each day of the importance of developing an early understanding of the number ten and how it is used in our place value system. Traditional sit and get teaching models require that students memorize an algorithm. While there is a time and place for these algorithms, young students need time to handle and play with numbers. Beginning with concrete manipulatives and later transferring these concepts into more abstract written format (pictures and numbers). This time of exploration paves the way for mental math. After googling and scouring Smart Exchange looking for a well crafted lesson plan tied to literature. I quickly discovered a lack of resources. I found several slide shows and many textbook examples, but no complete units that hit the mark. With all of this in mind, I began to search for quality literature that incorporated place value and regrouping. My search lead me to The Good Neighbor Series written by Marc Ramsey and illustrated by Susan G. Robinson. Below you'll find the first installation of Common Core lesson plans and interactive student pages based on The Good Neighbor Series. This lesson can be down loaded for free by visiting Tennessee Trending Teacher wikispace on the Second Grade Common Core Lessons page. There are two versions available Smart Notebook and powerpoint. Please note that the powerpoint version does not have the same interactive components as the smart document. 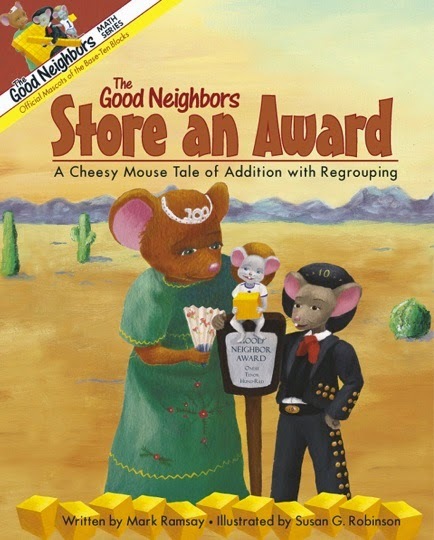 So here you are… Store an Award a Cheesy Task: Addition with Regrouping.